Lafutifine Phthalimide CAS number 146447-26-9. It can get through 4 steps reaction. Specific experimental procedure is as follows: Weigh 960 gram of 1,4-butylene glycol, add 1200ML chloroform, and then add 20ml concentrated hydrochloric acid,under ice-salt bath,cooled to about 5 ℃, dropwise 2,3-dihydro-4H-pyridine 100 grams, vigorous stirring, the control temperature at about 10 ° C, after dropping finish,heated to room temperature, stirring for 4-5 hours, adding sodium bicarbonate to adjust the ph value to 7. Filtration, concentrated to get 1800 g material from the first step, weighed 350gram of the first step material, 208 g of 2-bromo-4- (piperidinomethyl) pyridine, 110 g of sodium hydroxide, 110 g of K2CO3, 25 g of tetra-n-butylammonium bromide, , Placed in 3L three-necked flask, heated to 105 ° C and stirred for 36 hours, the reaction solution was poured into 2 times the volume of water, liquid separation, the aqueous layer was extracted 2-3 times with toluene, washed 1 times, diluted the solvent to get the second step material to get 256 grams of product. 120ml of concentrated hydrochloric acid was diluted to 1500ml, were added to 256g of the second step material and 1500ml of toluene, stirred at room temperature for 12 hours, allowed to stand, liquid separation,extracted the toluene layer with 80ml of concentrated hydrochloric acid and 1000ml of water, combined aqueous layers, were washed with chloroform and ethyl acetate successively, respectively, the aqueous phase was adjusted to pH 10-11 with K2CO3 and extracted three times with chloroform. The layers were suction filtered with chloroform and put 1.5 cm thick silica gel ,drying filtrate to get 216 g of the third step product. Then add 216 grams product into a 5L three-necked flask, dissolved in 3L of dichloromethane, ice cold.166 g of K2CO3 was added dropwise 140 g of thionyl chloride , After the addition was completed, the temperature was raised to room temperature and stirring was continued for 4-5 hours. The mixture was filtrated with suction, and saturated aqueous NaHCO3 was added to the filtrate to adjust weakly basic to separate the organic phase. The organic phase was washed once with water, separated, suction filtered, the filtrate was dried under reduced pressure to give 100 g of the fourth step product. 100 grams of the fourth step, 1500ml of toluene, 130 grams of potassium phthalimide, 14 grams of tetrabutylammonium bromide was heated to 80 ° C ,stirring for 6 hours, cooled, washed with 1mol / L NaOH aqueous solution, Washed once more with water, filtered and concentrated to give the desired product Lafutifine Phthalimide CAS number 146447-26-9 ,after refined, material looks like white powder. Our Lafutifine Phthalimide have a stock scale of more than one tons. Lafutidine intermediate 6 CAS number 146447-26-9, which is a seemingly simple, practical synthesis with a very difficult intermediate. Most of manufacturers use (Z) -2 - ((4-bromobut-2-en-1-yl) oxy) -4- (piperidin-1-ylmethyl) pyridine and phthalimide potassium salt as raw materials , After one-step reaction to get the basic compound of lafutidine intermediate 6 CAS number 146447-26-9 , and then use the basic compounds and maleic acid to form salt and then recrystallization and refining to get the target product of lafutidine intermediates 6, its chemistry nature is more stable than its basic compounds, it it is more easy to facilitating storage and further purification. If use the lafutifine intermediate 6 to synthesis the downstream intermediate primary amine, it is only necessary to decompose its maleate with sodium hydroxide before use. However, the primary amine impurities obtained by this method are too high and require repeated recrystallization to meet the market requirements. It has been found that the use of hydrazine hydrate in the production of Ing-Manske reaction is the root cause of the relevant impurities, some people has been starting study the use of methylamine, polyamine and other hydrazine hydrate instead of hydrazine, it should be said to use amine solution instead of hydrazine solution is the trend to solve this problem. Looking for ideal Lafutifine Phthalimide 146447-26-9 Manufacturer & supplier ? We have a wide selection at great prices to help you get creative. All the CAS 146447-26-9 are quality guaranteed. 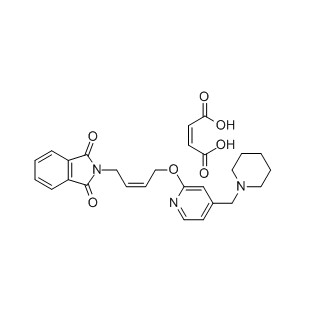 We are China Origin Factory of Intermediate of Lafutidine CAS Number 146447-26-9. If you have any question, please feel free to contact us.